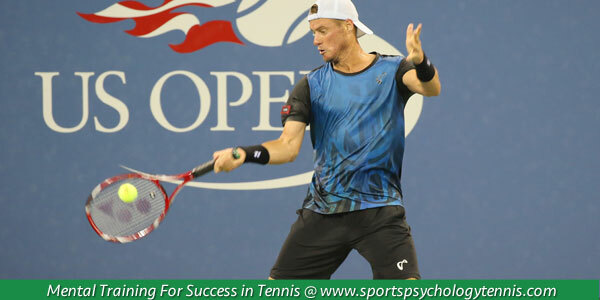 What Should You Focus on in Tennis? Prior to a tennis match, are you fearful of losing? Do your emotions get out of control when you make an error on the court? When you define yourself by win and loses, it becomes practically impossible to focus on the process of just playing–and have fun. Your thoughts distract you from focusing on the present point. Your fear of failing becomes overwhelming and mistakes become disastrous events. You feel so anxious while playing that you can’t seem to play loose like you do in practice. 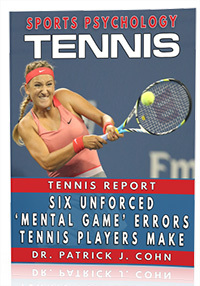 I interviewed tennis expert Jeff Greenwald in regards to focusing on the process in order to play tennis at your peak. Greenwald is a peak performance consultant and licensed psychotherapist. Greenwald was ranked #1 in the world by the ITF and #1 in the U.S in singles and doubles in the men’s 35-age division in 2002. GREENWALD: “Over the years, I have become really passionate about how to balance the incredible outcome nature of sports towards winning, what we get out of winning without getting rid of it. GREENWALD: “If I were to highlight the two symptoms that emerge, I would say performance anxiety (not playing as loosely in big matches to the extent they are in practice) and frustration management (being able to handle mistakes, winning and losing) are the main issues. Tip #1: Let your sport be your sport. Play for yourself. Rediscover why you like playing tennis in the first place. Tip #2: Take your practice game to matches. Examine the mindset that keeps you playing loose in practice and transfer that to match situations. 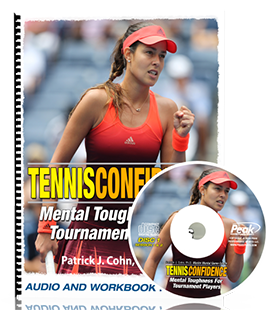 The fastest way to improve your mental game for tennis is with one-on-one mental coaching for tennis players.